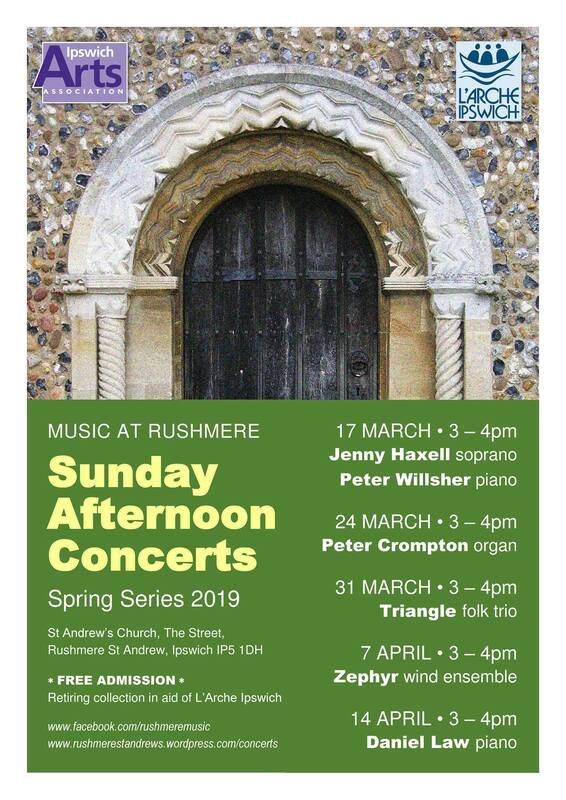 Triangle are excited to launch new repertoire – and old favourites – with a concert at St Andrew’s Rushmere, part of the St Andrew’s popular Sunday Concerts season. 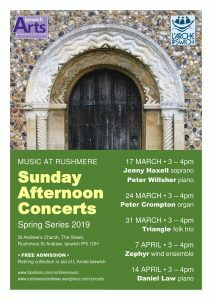 Come and listen in the beautiful surroundings of this historic church. We believe there will be cake afterwards! Yes, we’ve been away for a while, but we haven’t been idle! We’ve been taking out to develop new music and exciting new directions. Don’t worry – we are still us! As I (Mim) write this, winter 2018-19 is leaving in a huff, slamming the door rudely as he goes. Not to be outdone, Spring, rude girl, is kicking the door with her crocus-embroidered Docs as she barges in. So, er, it’s March, and it’s a bit windy. After a year closeted with our new material, we dared to put our heads over the parapet on air with our great friend Roger Pettitt in his “Roots and Shoots” show on 107.5 (Monday evenings live, 7pm – 9pm). And now we are setting forth again. Join us at Rushmere St Andrew church, on Mothering Sunday (31st) from 3pm. It’s Triangle live and in concert! Oh yes! Oh YESSSSS!!!!!!!! The moment you’ve been waiting for. Shiny new albumÂ Â “This Will Go Onward The Same” goes LIVE on October 13th 2016. Official launch gig on Saturday October 15th at 7.30pm, to be STREAMED LIVE on t’internet thingy (streamimg details to be provided when we’ve got them from the Techie Team). After several false alarms, the band is finally pregnant with The Next Album! Work started in earnest yesterday and a live recording engineer has been located!Â There is even a set list!Â If all goes well, we expect to deliver in mid-2016.Â Now, we are going to do our exercises, take our vitamin supplements, have our afternoon naps and get our friends to start knitting………. OK, I’ve very nervously logged in (as the band technophobe) so, er, hallo everybody, this is posh isn’t it? Suffolk-based Triangle were, for me, THE highlight of the day. I already know, and enjoy their first album "Time Out Of Mind", but I was mightily impressed not only by their chisel-sharp a cappella harmonies, but by the way that they act out the song, to frequent giggles and guffaws from their audience. They claim that the answer to every problem is beer. Show me a folkie who disagrees with that. "An all-round entertaining package rather than just plain songs"